If I had ever sat down to write a bucket list, going to the Franschhoek Literary Festival would have been at the top. So, flying to the Western Cape this weekend and meandering through the wine lands to reach the normally sleepy town was a highlight. Franschhoek was abuzz with booklovers roaming past posters containing writer-ly quotes. 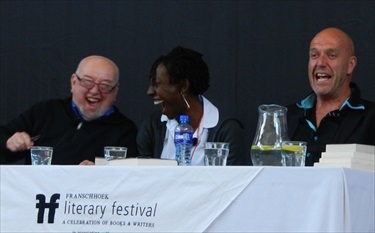 In church halls, school halls and town halls, panels of well-known South African and international authors discussed books and the writing process. And, indifferent to the fact that my library is cracking at the seams, booksellers sold an alluring range of books at all the venues. I was in heaven!